Juan Ramirez has been a professional flamenco guitarist since 1974 and formed his first dance group ‘El Cuadro Flamenco’, in April of that year. They performed his first full-time engagement with a six month summer season on the island of Jersey in that year. Since then, from 1977 he formed the renowned dance company and group ‘Viva Flamenco’, which is based in London in the UK and having moved to near Diss in Norfolk two years ago, he still travels to gigs country-wide and abroad. He has performed all over the world to-date in many divers venues from The Royal Albert hall in London, large and small arenas in the USA, and to a sports Stadium in Germany, where he produced the flamenco scene in the world’s largest production of the opera ‘Carmen’. Song writing and arranging have played a more prominent part in his life in the last fifteen years or so, including a ten year collaboration with the legendary film star and actor Sir Christopher Lee until the star’s passing a couple of years ago. This consisted of performing and writing music and lyrics for Sir Christopher and co-producing on three music albums, being a mix of flamenco and heavy metal styles – two notable successes being the flamenco rumba called ‘Carmencita’, which reached number six in one of Spain’s music charts and his re-writing a single of the famous Christmas song ‘Jingle Bells’, re-titled ‘Jingle Hell’ in a heavy metal style, which reached No 18 in the US Billboard charts. Other music collaborations include the single ‘Stronger’ with Garry Barlow and ‘The Desperate Hours’ with Marc Almond plus a track with Vanessa Mae on one of her albums. There have been numerous radio and film appearances (including performing with his group Viva Flamenco in the 1983 film ‘The Curse of the Pink Panther). Several TV shows including ‘The ‘Generation Game’ with Bruce Forsythe, two episodes of the hit comedy ‘Duty Free’, an episode of ‘East Enders’, a TV special with the legendary Eric Sykes and many other shows nationwide. 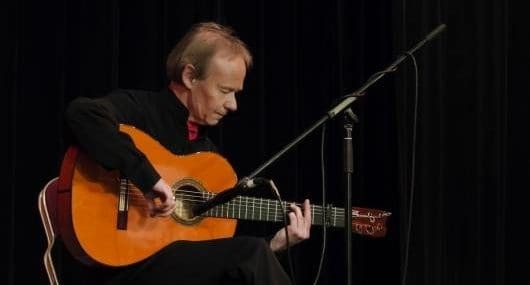 He has been teaching flamenco guitar since 1972, both at home privately and giving workshops in the UK and in Andalucia in Spain and continues to run the dance company, which has seen the addition and development of the careers of many dancers, singers and guitarists to date. This site is maintained and updated by Viva Flamenco. We in no way claim rights in the artwork displayed herein. Copyrights and trademarks for the books, films, articles, merchandise and other promotional materials are held by their respective owners and our limited use of these materials is done by permission or is allowed under the fair use clause of the Copyright Act. Design and original photography however, are copyright © 2017 Viva Flamenco.